The Communists, led by Mao Zedong, and the Nationalists, led by Chiang Kai-shek and backed by some Western nations, fought to remake China. 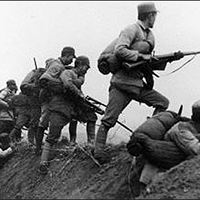 More than a million Chinese died in this war. The Nationalists eventually wound up in Taiwan. Mao soon extended Chinaâ€™s regional influence by tipping the balance in neighboring civil wars, first in Korea, then in Vietnam.